For students who do not have a high school degree, getting a GED can be the first step toward college acceptance. Will a GED give you the same edge as a high school diploma? Probably not, but the difference may not be as large as you would expect. For the most part, colleges will accept a GED as a guide for your basic intelligence level, learning skills, and problem-solving abilities. However, if you are applying to a school with other programs, such as mechanics and science, you will need additional ways to show your level of knowledge in those areas. Many colleges welcome those with GEDs. In fact, many college counselors will tell you that not only do people with GEDs get accepted into college, but those people do very well once they are admitted. The reason for this, they say, is that GED students have a very strong work ethic from the all the extra work they have had to put into their education to receive their degree. Universities are a different matter. While a GED is acceptable as a replacement for a high school degree, it usually is not enough to get admitted. For large universities, a student needs to have experience in classes from many areas, such as math and science. Sometimes, classes previously taken in high school will count. What is generally recommended, however, is that GED students ‘upgrade’ their education. This can be done through things like night school or correspondence courses. Even with this extra effort, there are no guarantees. Results will be much more favorable, but they can ultimately be disappointing. Universities, especially, do not admit many GED students based solely on academics. This is true even though the GED is made at a level so that one-third of high school graduates would fail. It doesn’t seem fair, does it? So, what should you do if you are a GED student and want to go to college? Your best bet is to upgrade your education in the manner that was previously mentioned. Focus on obtaining a well-balanced academic resume. If you are lacking in the science department, try taking a science class at night or through correspondence. Also, don’t get your hopes up too high about attending a large university. Getting into a small college is a great achievement. Remember that hard work and using the proper channels can go a long way. If you obtain your GED and follow that up with a well-rounded education, there is a great chance that you will be continuing that education at the next level. 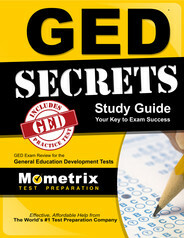 Ace the GED test using our GED exam study guide with practice questions. 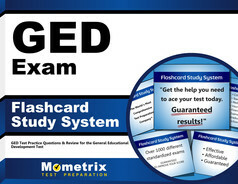 Quickly Solve Difficult GED Test Questions with the GED Flashcard Study System.